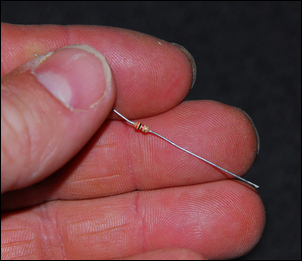 Using a simple and cheap resistor to.. If you scan the screens of eBay it won’t take you long to find the marvellous, magical, resistor power upgrade trick. For my car, a Honda Insight, you can buy a box (it’s probably just a resistor and a switch) that will give the Insight a claimed 30 more horsepower – or, if you want, 20 per cent better economy! Since the Insight is amongst the world’s most fuel-efficient cars, 20 per cent better economy is the stuff of hallucinations, while 30hp (about 22kW) represents a 40 per cent power increase – completely and utterly absurd. 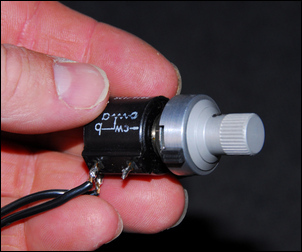 The resistor trick is based on this idea: you add the resistor to the engine coolant temperature sensor circuit, or the intake air temperature circuit. This tells the ECU that the temperature is different to its actual value, and as a result, the ECU adds more fuel (or less fuel, depending on the direction of the modification), or more ignition timing or less ignition timing (again, depending on which way the mod takes the perceived temperature). To suggest that such changes will result in enormous power gains, or huge improvements in fuel economy, is just rubbish. But let’s not throw the baby out with the bath water. If a clear idea of what is able to be achieved is understood, such resistor changes can indeed be very effective. In fact, in bang for your buck terms, using simple resistors can be quite brilliant. 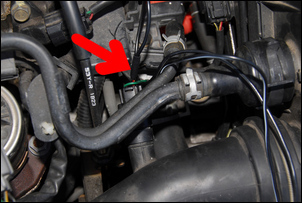 Intake air and coolant temp sensors use variable resistance designs – that is, they vary in their resistance to current flow with changes in temperature. Normally, they are Negative Temperature Coefficient (NTC) devices, where resistance (measured in ohms) increases as the temperature decreases. This sort of information is available in workshop manuals, or you can test a sensor using the sensor, a thermometer, a multimeter and a saucepan of hot water on the stove. To carry out this test, simply connect the multimeter to the sensor and place it in the water. Measure the temperature of the water and note the sensor resistance. Then heat the water, measuring the changed resistance of the sensor every 10 degrees C.
If you have an NTC sensor and you want the ECU to think that the temperature is colder, you add extra resistance in series with the sensor. If you want the ECU to think that the temperature is hotter, you add the resistance in parallel with the sensor. ...or parallel (to decrease the resistance). So what engine changes are likely to result from altering sensor resistance? 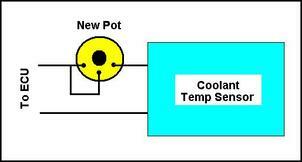 The coolant temperature sensor controls almost exclusively the amount of fuel enrichment during times of cold running. 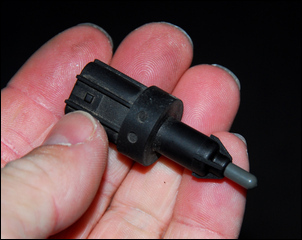 The output of the intake air temperature sensor is frequently used by the ECU to determine the final ignition timing advance. But both summaries are simplistic: the ECU will use the inputs of sensors in more than just one way. In some cases, dozens of maps may be based on these inputs. I snipped the signal feed near the sensor itself (this could have been done at the ECU but it was simpler to do it under the bonnet) and wired-in a 5 kilo-ohm pot wired as a series variable resistor (ie as shown above in the first diagram). I used a 10-turn pot so that changes could be made very gradually, but a normal pot could be used if care was taken with rotation. The greatest care should be taken to listen for detonation. If you don’t have an acute ear for it, do an AutoSpeed site search for some of the electronic detonation detectors we have described. Of course, high octane fuel should also be used. But what was actually happening under the bonnet? The easiest way of finding that out is to use some test instruments. 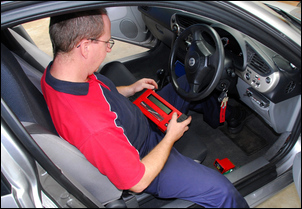 Lachlan Riddel of Gold Coast tuning company ChipTorque was kind enough to make available a Snap-On diagnostics tool. This could read the generic OBD data stream, albeit at a very slow rate. The OBD reader showed two important data – firstly, the temperature the ECU thought the intake air was, and secondly, the actual ignition timing being used. With about 3000 ohms of extra series resistance, the OBD Reader showed that the ECU was measuring intake air temp at about 1 degree C, on this day about 25-30 degrees C lower than reality. Test driving showed that the ignition timing being used in light load, constant throttle conditions at about 70 km/h was 4-5 degrees more advanced than standard (eg about 30 degrees rather than 25 degrees). The low update speed of the OBD stream made measuring dynamic and full-load changes impossible. This increased timing advance matched my seat-of-the-pants judgement – but I’d wanted to make sure that massive changes weren’t being made that in turn were being retarded by the knock sensor. 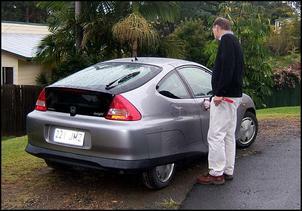 In a MAP-sensed car like the Honda, the intake air temp will also help determine the mixtures. This is because the ECU uses rpm, MAP and air temp to calculate the grams/second of air that’s being inhaled. Tell the ECU that the air is colder (ie more dense) and the ECU will inject more fuel to go with it. With the air density in fact unchanged, this will result in a richer air/fuel ratio. 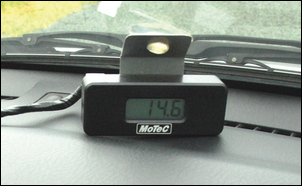 A MoTeC professional air/fuel ratio meter was used to measure actual on-road mixtures. As expected, when in closed loop, the air fuel ratio stayed at stoichiometric (ie about 14.7:1) and lean cruise (around 25:1) also appeared unchanged. However, full load high rpm mixtures (where the car goes out of closed loop) were richened from about 12 – 12.5:1 (the full load mixtures vary a bit over the upper rev range) to 11.5 – 12:1, ie about half a ratio. This means that when this air/fuel ratio is being used, the car will use something like 4 per cent more fuel. However, that driving condition is a rare occurrence. So with 3000 ohms added to the intake air temp sensor and using 98 RON fuel, the car drives better, can be changed up in gear earlier, and feels to have better part-throttle torque. But what happens when it really is cold? After all, the modification is effectively subtracting a lot from the real temp. Probably not much happens – the handbook suggests that -20 degrees C is the lowest the ECU will recognise. By using a pot (rather than a fixed resistor) in the initial configuration, you can twiddle it to your heart’s content. 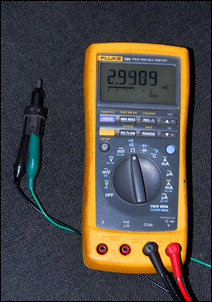 When you have decided on the value that is required, the pot can be removed and its resistance measured with a multimeter. A fixed value resistor of the same value can then be wired in series with the temp sensor and the lot covered in heatshrink or tape. And that’s just what I did, using a 3.2 kilo-ohm ohms resistor (that actually measured closer to 2.9 kilo ohm!). This is not a groundbreaking modification. There’s not 30 more horsepower or 20 per cent better economy. But this is better than those claims – because it works. There’s clearly improved driveability and potentially a little better urban fuel economy. And at a cost of less than five cents (the cost of the resistor), that’s one helluva bang for your buck. It’s very likely that this modification will work in other cars that use an intake air temp sensor. The fuel octane must be raised (and that could be by water injection!) and as always, care should be taken when tuning the set-up. But where there’s headroom to detonation, increased ignition timing achieved by modifying the intake air temp sensor is certainly worth a try.